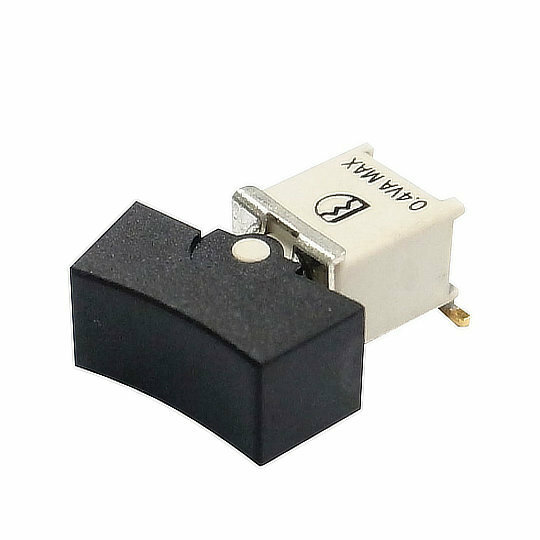 The 4B series of surface mount sub-miniature rocker switches from Dailywell are single pole switches with double throw operation and maintained or momentary action. Available on embossed antistatic tape or reels the 4B series are designed for fully automated production with flow soldering and cleaning processes in mind. The 4B series of surface mount sub-miniature rocker switches from Dailywell are single pole switches with double throw operation and maintained or momentary action. Available on embossed antistatic tape or reels the 4B series are designed for fully automated production with flow soldering and cleaning processes in mind. Available in standard or right-angle surface mount terminals in silver, gold over silver or gold the electrical ratings for terminals in silver/gold over silver are 3A at 120VAC/28VDC or 1A at 250VAC and gold 0.4VA at 20VAC/DC. The 4B series perfect for applications such as Instrumentation, Test Equipment, Telecommunications, Networking and Audio/Video Mixing Boards.